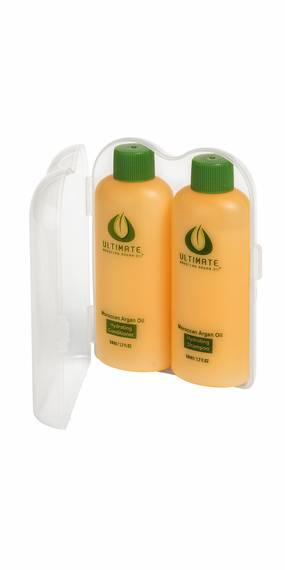 This travel kit is convenient for travel and consist of both the shampoo and conditioner in 50ml bottles. Shampoo: Gently cleanses while infusing hair with argan oil that is rich in nutrients. Bring back life and luster to your hair with the ULTIMATE Moroccan Argan Oil® Hydrating Shampoo. Infused with argan oil that is rich in essential fatty acids, antioxidants (such as vitamin E and carotenes) and natural moisturizers, this shampoo is specially blended to help restore health and shine to hair. ULTIMATE Moroccan Argan Oil® Hydrating Shampoo is a great moisturizer that will clean and leave your hair beautifully strong and revitalized. A little will go a long way in this 50ml bottle. Conditioner: Gently detangles and reconstructs hair while infusing hair with argan oil that is rich in nutrients. Repair your hair with ULTIMATE Moroccan Argan Oil® Hydrating Conditioner, made especially to detangle and rehydrate your hair strands. This fantastic conditioner is made with a unique blend of ingredients, including argan oil that is rich in essential fatty acids, antioxidants (such as vitamin E and carotenes) and natural moisturizers. Vitamin E, one of several antioxidants in argan oil, helps heal hair and prevent split ends while strengthening hair with the help of several essential fatty acids found in argan oil. Rebuild and revitalize your hair, whether it is perfectly healthy or suffering from damage. Leave your hair with a wondrous feeling of silky smoothness and lustrous shine, completely hydrated and full of flexible elasticity. Shampoo: Apply to wet hair and gently massage into scalp. Rinse and repeat as needed. For the best results, follow with ULTIMATE Moroccan Argan Oil® Clear Hydrating Conditioner. Conditioner: After cleansing with ULTIMATE Moroccan Argan Oil® Hydrating Shampoo, gently squeeze excess water from hair and apply conditioner from scalp to ends. Leave on 1-2 minutes. Rinse well. Avoid contact with eyes.